The day before the ceremony, Whitney Houston died in Los Angeles, and the show's producers quickly planned a tribute in the form of Jennifer Hudson singing Houston's "I Will Always Love You". The awards show began with a Bruce Springsteen performance followed by an LL Cool J prayer for Whitney Houston. Adele won all of her six nominations, equalling the record for most wins by a female artist in one night, firstly held by Beyoncé Knowles. Foo Fighters and Kanye West followed with five and four awards, respectively. The 54th Grammys were the second-highest rated in its history with 39.9 million viewers, second only to the 1984 Grammys with 43.8 mil. viewers. The rating was 50% higher than in 2011. Abe Laboriel, Jr. "Golden Slumbers"
↑ "Jason Aldean, Lady Gaga To Perform At "The GRAMMY Nominations Concert Live!!"". GRAMMY.com. October 25, 2011. Retrieved November 18, 2011. ↑ Mervis, Scott (December 1, 2011). "Grammys stumble with Kanye West album snub". Pittsburgh Post-Gazette. Retrieved December 15, 2012. 1 2 3 "Grammy.com". National Academy of Recording Arts and Sciences. February 12, 2012. Retrieved February 12, 2012. ↑ "Paul McCartney Is 2012 MusiCares Person Of The Year". GRAMMY.com. Retrieved November 18, 2011. ↑ "Adele wins 6 Grammys, including record of the year". The Clarion-Ledger. Gannett Company. February 12, 2012. Retrieved February 12, 2012. ↑ Braiker, Brian; Alston, Joshua (February 13, 2012). 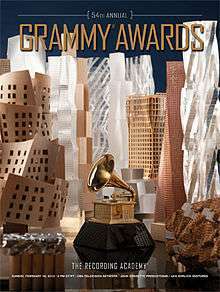 "Grammys 2012 – as it happened". Guardian. London. Retrieved March 6, 2012. ↑ "Whitney Houston Tragic Grammys Draw 39.9 Million Viewers, Second Most Watched Ever". Deadline.com. February 13, 2012. Retrieved February 14, 2012. ↑ Chianca, Pete (February 13, 2012). "Grammy disappointment: Tribute to Clarence Clemons was scrapped, says report | Blogness on the Edge of Town Massachusetts". Blogs.wickedlocal.com. Retrieved January 14, 2014.